The London Brydges street congregation followed the call to enter into Christ’s mission on Saturday Dec. 3. A group of people got together and planned a strategy we hoped would encourage people that lived within 5 minutes of our building to come and have a meal with us. Were we hearing God`s call or were we just not thinking rationally? Our neighbourhood is made up of a mix of approx. 60% middle class people and 40% with little to no means. We had sent out flyers five times over the last two years; our first for a strawberry social. We had 4 people come. An outdoor barbeque fun day in front of our congregation attracted about 40. This time we delivered 850 flyers to homes. We were moving out in a direction that wasn’t completely unfamiliar to us but we did not know what to expect. Our hope was to feed 250 non members and only feed ourselves with the leftovers at the end of the night. 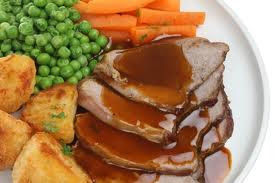 Our meal planners developed a menu of a full course roast beef dinner. No one would leave hungry. Price: Adults $2.00, Children 14 and under $ 1.00, 5 and under free. Even with donations of food etc. Our cost was $ 568.00. Members gave of their time (most were there from 10 AM on Sat.). At least 40 helped out throughout the day of our meal. What a feeling of sharing and love was felt as the excitement of the day built towards our 5:00 o`clock invitation time! What did we receive from God for our efforts? The first people came at 4:40. By 5 PM we had 25 guests. They took the survey sheet and before the end of the evening 25% of the people filled them out with suggestions. We fed 72 people, and in reflection, God knew we could handle 72. Guests shared with each other and with us. Most stayed for at least 90 minutes and some for over 2 hours. One family of meagre means, husband and wife and a teenage daughter, stayed for about 1 hour. Our members serving them were given many compliments and told how great the evening was for them. As the mother was leaving she was asked if she would like to take some extra food home and she replied, “Oh, no thank you” but exclaimed, "This was the best meal that I have ever eaten in my life!” The genuine way she said this was enough to bring tears to our eyes. Asked again if we could pack something for them, we were told no but they would be remembering this night for a long time and looked forward to more flyers. A young, more affluent family rushed in just before 7 and sat down explaining their 3 teenage boys had been playing hockey and were very hungry. They had visited another event some months earlier and felt they could not miss this evening. The mother filled out her card answering the question regarding needs of the area. “Awareness of dealing with mental illness”, she stated, and she would like to assist with a program to help with this need. She signed her name with contact info. • are we a child friendly church? • And finally, will we be doing more nights like this? One set of grandparents came with a grandson of about 10 and another couple. They stayed for over 2 hours. On leaving they asked for take-out meals and then went to their car only to return in a few minutes with a sheepish grin and say that their grandson was still playing in the church with the member’s children. They almost forgot him as they and he were so well entertained that they had hardly seen him throughout the evening. We invited people to come, God provided them. We fed those with needs: hungry, lonely, and looking for knowledge of our church. We provided literature to those that had inquiries (enduring principles and basic beliefs) and we met in community. Did it end there? The next day we had a lady visit for our Sunday worship service. (We usually have around 50 for this service but had closer to 80 on this day.) She recently moved into the area but did not receive the flyer. She said she had been thinking of coming to our church for some time and that she knew she had to come this Sunday. Arriving just before the service started, several of our members welcomed her. After the service she stayed and shared her life story with our Pastor for about 30 minutes, then asked if she could be baptized. She is planning on starting classes in the next few weeks. While we were enjoying the extra roast beef on Sunday for lunch, another non-member in our congregation asked an elder if he could be baptized. Two separate requests for baptism within minutes; God’s Spirit in abundance! The energy of the week-end was very high. At about this time another person walked into our church and asked if we were planning more events for people to come and eat with us. He could not come the night before but his brothers were there, and he came over to discuss our future plans. He was invited to eat with us, and to “just go get a plate.” He said no, but he would like to put his money into the pot we had there. He reached deep into his pocket for his $2.00. After our free will offering lunch we had a net profit of $4.00 for the week-end! If we are going out in mission with no idea of the outcome does Jesus know what He will provide to us? I do not know the answer, but I can tell you that what happened on Saturday evening December 3, 2011 has us listening to Him for direction. We are now looking into filling some needs with helpers that are willing to assist us in Jesus’ Mission. HOPE, the theme for the second week of Advent, has been well shown to us at Brydges Street Community of Christ. I am reminded of the admonition to "Feed my sheep" (not count them). I just read the article on "Dinner", and wanted to share with you an amazing experience I had last year. My son Christopher asked me if I would be interested in helping out with a church project he was involved with. (Calvary Missionary Church). It was the a Fun Day to be put on at an area we locals refer to as "The Ghetto" which is one of two government housing projects in the city. I was only too happy to help out. On the morning of Fun Day, we went to a little park in the centre of the project and began to set up tables. His church asked local merchants for donations of money, hotdogs and hamburgers, condiments, chips, pop etc. Some of the church men brought their BBQ's and the church youth group blew up balloons, and set a display up with little cards for their Awana program. At first ,the people just came out to the end of the street and looked down towards the park. Then little children came, and grabbed a balloon and a hotdog. A lady had set up a blanket under a beach umbrella and was reading bible-based storys, and before long, had quite an audience of little listeners. Soon, the people began to pour in...not just from the projects, but from the surrounding neighbourhood. We ran out of hamburgers, but we still had lots of hotdogs and chips and apples. My son and a couple of the other men brought bats and gloves and started a game of 500. A group of rough looking guys late teens early 20's...shirtless, tattooed and covered with piercings arrived and stood watching us with their arms folded across their chests. They refused our offer of food. They were watching the ball game, which had by now become 2 teams, a mix of old and young. A little guy of about 5 got up to bat. The bat was bigger than he was!! Suddenly, one of these intimidating guys, walked up behind the little guy and put his arms around him and the bat, and helped him hit the ball. Then he cheered the little guy on as he ran around the bases. Before long this guy and his rough looking friends were involved in the game...mostly helping the little ones. I was blown away by this. The day, which was to go from 10-2 ended up going much longer. All the Awana cards were gone, so was the food. As we drove home , families on their front porches waved to us as we went by, and the little ones raced us on their bikes and scooters, with balloons tied to the back of them. Last year, Awana had a large number of these children enrolled in their program. The manager of the project contacted the church and asked if they would make it an annual event, AND put on another Fun Day for the second government housing project. I was unable to help this year due to surgery, but I can tell you,it did more for me than anyone. I will help again next year. I don't know about any of the locations of your Congregations, but if they have nearby housing projects, this might be something they would be interested in doing. Its the most rewarding thing I have ever done. Sorry this is so long, but I felt the urge to share this with you after reading todays Blog. have a great day, and Merry Christmas to you and Joan. When our churches can touch people's lives in such a meaningful way, bringing a message of hope and joy, I think we really are bringing the Peace of Jesus Christ to bear in our communities. Thank you very much for sharing your story. It is an inspiration. Wonderfully inspirational story. Thank you, Paul. Excellent event Paul and Wonderful report and idea Paula! "it" really and truly is ALL about God's saving grace that comes to us in a touch, a dinner or even a balloon! Christ's mission is indeed our mission. I am so happy that the response to your "invitation" was such a positive experience for the neighbourhood and the congregation. I can feel the joy down here in Independence. Thank you for sharing such an uplifting story of God’s people moving out in faith and responding to the needs of those whom God has planted all around them. Amen Brydges Street!! Wow, we are so excited for Brydges Street congregation for the vision you have taken and the accomplishment of that vision into practical life changing events. May God continue to bless you as you reach further into what God is calling you to do.